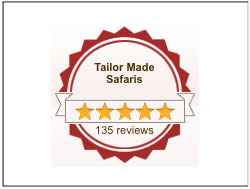 Why travel with Tailor Made Safaris? Okay, admittedly every tour operator says they're the best, so there we are no different. Where we are different is that we can actually back up our claim with solid arguments. Let's have a look at some of our unique selling points! ​Our slogan is: drive less: experience more. Spend more time at destinations and less time on the road. South Africa is huge, larger than Western Europe. Would you travel through entire Europe in 2 weeks? Sightseeing from the one famous place to the next, every day driving hundreds of km on highways? No? Then you won’t enjoy doing the same in South Africa! 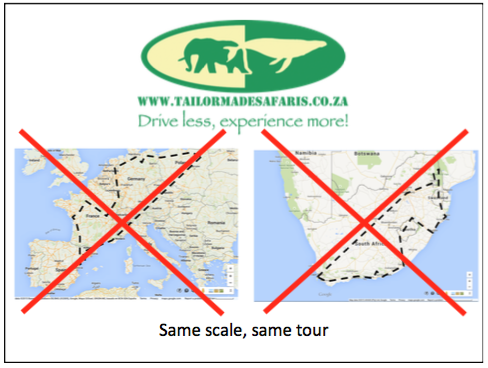 Click here for a comparison between a tour of Europe and South Africa of the same scale. At Tailor Made Safaris, both guided and self-drive tours are well balanced to ensure that as little time as possible is spent on the roads. 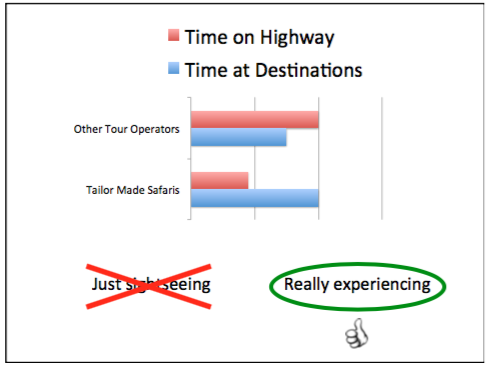 A recent study concluded that our tours spend less than half the time on highways compared to our competitor’s tours! We combine a relaxed travel tempo and genuine experience, rather than rushing around from one 'highlight' to another. We spend multiple days at destinations! This way, our clients have time to actually experience each destination that they visit, and find time to relax. You are on holiday after all! 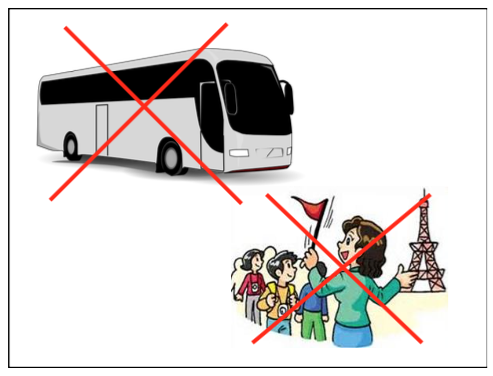 We avoid mass tourism. We use only small and stylish accommodations, like guesthouses rather than hotels, and often include less well-known destinations on our tours. Such places are often more authentic and personal, often cheaper as well. 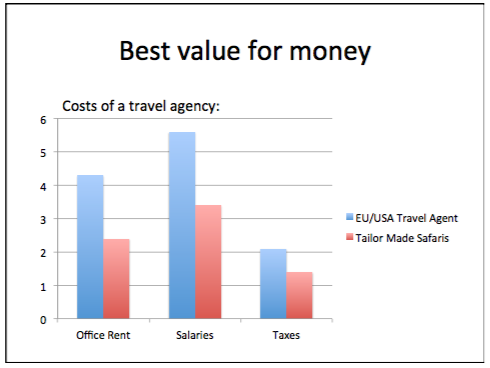 This all contributes to your experience, while keeping the trip affordable. Sustainable: Your entire safari trip with us is carbon neutral, as we offset all carbon dioxide emissions through an approved organization. 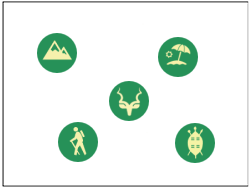 With us you travel ‘green’! Successful travel formula: We listen to your specific interests and requirements and combine this with our local knowledge and expertise to create the perfect Tailor Made tour just for you. And it is not 'just safari' that we include. We are famous for our balanced yet diverse program that also includes exciting activities such as hiking, whale watching, leisure time, and a 'sprinkle of culture' to top it off. Our booking process is personalized and all of our tours are fully and freely tailor-made to suit our client’s requirements. We make very clear quotes - You will know from the start exactly what is and what is not included in the price of your tour. Also, we are genuine local experts: We have immigrated to South Africa, and now that we live here we can truly say that we know all of the best spots. Being privy to all of the details, such as actual travel times and quality of the beds in different accommodations. 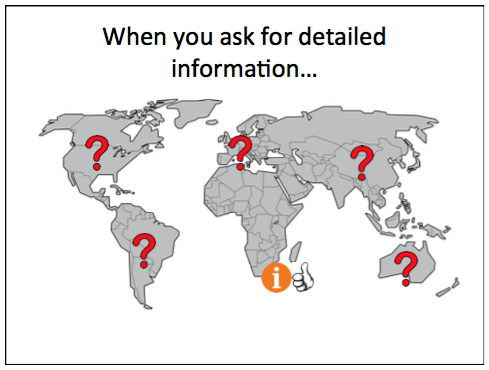 Unlike most European travel agencies or so-called “ South Africa Specialists” we are here, on the ground, ready to provide you with excellent service and substantiated accurate information. Most comprehensive self-drive travel package! 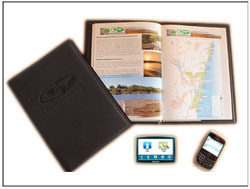 A full colour, hardcover, fully customised comprehensive travel guide, including your specific itinerary, exact GPS coordinates, detailed travel information and colour maps and photographs. Those that have booked one of our guided tours: We only use highly trained, professional and friendly safari guides, instead of generic tour leaders. Our tours are always fully private, meaning that we never put clients from different bookings together in a vehicle. And of course, no big coaches, you’ll be transported in a comfortable SUV or minivan! 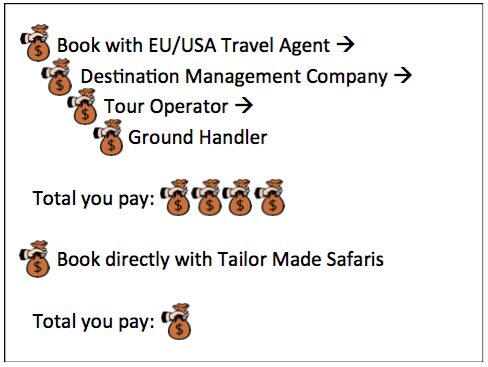 Travel agencies have costs to cover, which they work into the price to the client. As we are based in South Africa, and operate from here, we have to spend far less on overheads (office rent, salaries, insurances and taxes) than any of our European or American competitors. to offer you more value for your money! usually add afterwards on top of their quoted price to you. Don't believe us on our word! So we say we're the best, and give reasons as to why we think so. But you don't have to believe us on our word! Instead believe the hundreds of others who have had a holiday of a lifetime with us, and left an independent review!